We strive to put our hundred percent to resolve your issues and try our best to achieve your satisfaction! Our company pays great attentions to the shopping experiences and feedback from the customers.Your satisfaction and positive feedback with 5 stars is the motivation for us to move forward.It would be highly appreciated if you could leave a good review or a positive feedback to our product and our store. If you have any problems with our items or services, please feel free to contact us first before you leave negative feedback. We will do our best to solve any problems and provide you with the best customer services. The best option to starting learn about Arduino programming. 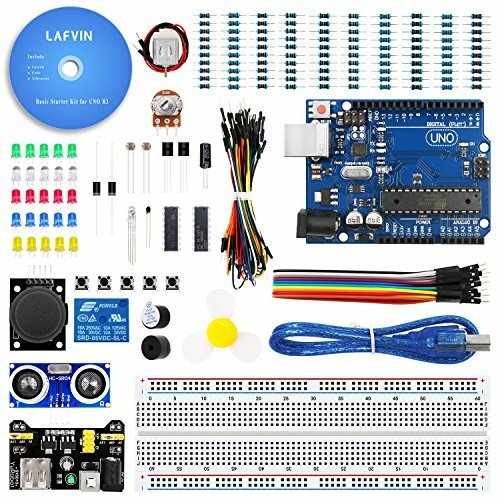 All components compatible with Arduino, can be used directly. With tutorial user manual containing PDF Lesson,code,Libraries, datasheets, and so on. Include High Quality Uno R3,830 tie-points Breadboard,Power Supply,Jumper Wires,Resistors,LED, etc. If you have any questions about this product by LAFVIN, contact us by completing and submitting the form below. If you are looking for a specif part number, please include it with your message.